US, 1989, 140 minutes (Director’s cut, 154 minutes), Colour. Ed Harris, Mary Elizabeth Mastrantonio, Michael Biehn. 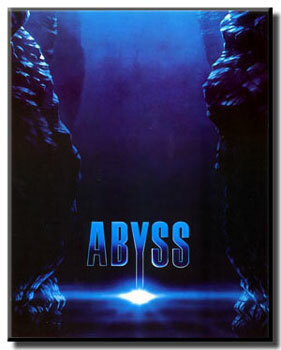 The Abyss is a spectacular blockbuster written and directed by James Cameron (The Terminator, Aliens). It came after such similar deep sea action adventures as Deep Star Six and Leviathan. This film has spectacular sets, a delight for those interested in deep sea technology. The plot is reminiscent of the B grade films (with a touch of that kind of dialogue). The plot comprises three ingredients: deep sea diving and oil rigging with supervision from the surface and consequent disasters; a mad bomber with a nuclear device; a mystical presence of non-humans, NTIs, non-terrestrial intelligences. This latter makes the film like something of an underwater Close Encounter of the Third Kind. Ed Harris is vigorous as the superior on the rig; Mary Elizabeth Mastrantonio is also vigorous as his estranged wife, the designer of the rig. Through life and, literally, death experiences, they find their love for one another again. The film ends on a very upbeat note. In the late 90s, Cameron released a longer, Director's Cut. 1. Popular spectacle? The deep, horror and accidents, the military subplot, science fiction and close encounters? How well did they blend? 2. The technology of the film: the surface ship and the surveillance, the cranes and towers, the hurricane? The undersea rig and its elaborate interiors, corridors, chambers? The underwater action? The vehicles, fights? The depth of the abyss? Stunt work, special effects? Editing and pace? Musical score? 3. The special effects for the non-terrestrial intelligence, their presence, taking human form, the mass of water, the colours and lights? The final emergence of the spire? The score for the NTIs? 4. The thriller and horror ingredients? Combined with the mad bomber? And the close encounters? The mysteries of the abyss? Good and evil? 5. The prologue, the nuclear submarine, the fear of the Russians, contact with the surface, technology in the submarine, the pursuit, the crashes? The approach of the creature? Disaster and death? 6. The rescue mission? The nuclear warheads? Coffey and his team? Tough, Coffey nervy, Lindsay's comments? Strict obedience of orders? The order from the top, arming the missile? The mission to the deep? Its success? The injuries of the team? Coffey and his brooding, alienation from the rest of the group, more and more berserk, cutting his arm to hold his nerves, the confrontations and the gun? Locking himself apart? The attack by Bud? The chambers, the fight to send off the nuclear warhead? The struggle in the vehicles? His being outwitted? His death? 7. The rig crew, their personalities and styles, men and women, working together? Big Guy and his close encounter? Hippy and his supervision? The driver of the vehicles? Their skills? 8. Bud, his leadership and responsibility, skills? Clashes with Lindsay? The irony of the revelation that they were married? Her arrival, their clashes? Decisions? The search, the fall of the crane and its effect? The closing up of the chambers of the rig? The drownings? Coffey and his mission, the nuclear warhead? His threats and menace? Bud and his companion swimming to confront Coffey, the fight? The chamber and the sending off of the missile? His working with Lindsay, in the vehicle, the proposal about saving her life? The return, the swimming, the resuscitation? The love? Their sharing the encounter with the NTIs? His going down into the depth, breathing the liquid? Typing his messages? Going down, the long flight down? Lindsay and her support? His success in disarming the weapon? Saying he had to stay? Being overwhelmed by the encounter? Mirroring his message? His being able to breathe? Rising again to the surface? 9. Lindsay and her toughness, knowing the rig, people's reaction, Coffey and his dislike (and masking her mouth)? Tough, supervision? The accident and the loss of power? The drownings? The encounter and her belief, trying to persuade Bud? The fight with Coffey? Her decision to drown and go into hypothermia? Her will to live, revival? Talking her support to Bud? The reconciliation and the happy ending? 10. Hippy, his rat, paranoid and conspiracies, the dangers, his work, his friendship? 11. The other members of the crew, their skills, the crises, tough? 12. Coffey's team and their desperation, following orders, the change, guiding Bud down to disarm the weapon? 13. The people at the top, the fear of the Russians, coping with the hurricane, the loss of the crane? Encountering the NTIs? 14. The themes of sea and space, the human frontiers? The similarities of gear, communication, travel? 15. The old-style plot, the '80s lavish treatment? The searching for meanings, especially peace?